Or "Oh hai! This mornin' mah bike wuz clean. Sorry U mis'd it!" I got up early, but had to wait to wash the bike. I figured the engine would run cooler with less mud, oil, and road salt all over it. Besides, the paint job likely appreciated the attention anyway! After the locals got me lost trying to get me to NAPA, I gave up, refueled, and got on the road headed toward Watson Lake, YT. 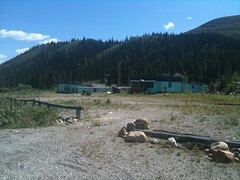 I figured worse case, I could stop there, but thought Teslin, YT would be the most likely last stop for the day. 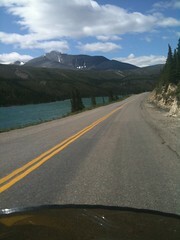 As I wound my way up the road toward Summit Lake, BC, I was nothing short of inspired. One unfortunate observation was that only 25% of the small shops, gas stations, or lodges along the way were actually open and not boarded up and barricaded! It sure made planning fuel stops interesting and adventuresome! As I was winding through the hills at a decent rate with a few other vehicles, the car in front suddenly slowed down and stopped. 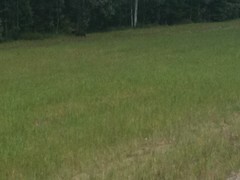 As I was stopping behind them, a black bear popped into view and approached the vehicle with me right behind them. I'm thinking photo op as he did not appear aggressive. As I reached for my iPhone, they sped off leaving me alone with the bear! He looked at me, decided to check me out, and approached me. I lost thought of the iPhone and popped into gear speeding away! I passed within a few feet if him on the way by and feel lucky he didn't choose to reach for me! All that and NO PHOTO! 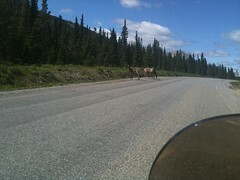 I did get to chill with some caribou and saw stone sheep as well, but had no chance for sheep photo due to traffic. 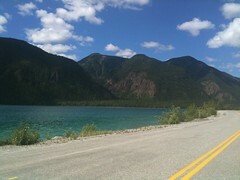 As I approached Muncho Lake (The most expensive place on entire trip for food or gas!) there were signs warning to "Watch for Buffalo!" posted frequently! 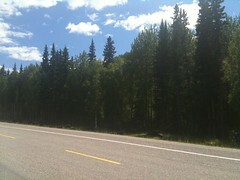 It was a gorgeous stretch of road! I rode for an easy 15 miles or more and nothing. Not one Buffalo! I had all but decided this was some tourist joke everyone is in on that has ever driven the AlCan when this guy appeared! 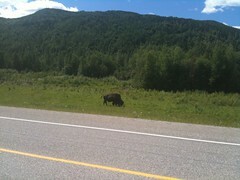 So I guess there really are several Buffalo along here! As I pulled into Watson Lake, I saw this Grizzly and figured he was far enough away and too interested in something there to be concerned with me. 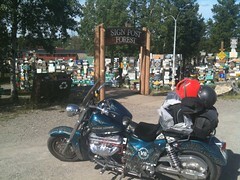 In Watson Lake, YT seeing the sign forest is a must! 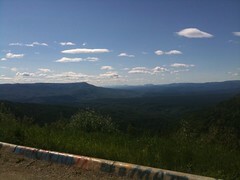 Afterwards, food for me, fuel and oil for the bike, and then on to Teslin, YT! I cannot emphasize enough how gorgeous the weather and view were all day long today. I've taken many more pics than are posted here and I'll dump them all into Flickr after I get home! 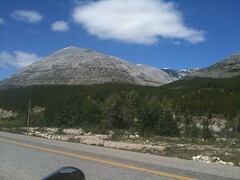 I was not even 10 minutes out of Watson Lake when I saw this! Gas became an issue as businesses were closing along the route for the night. 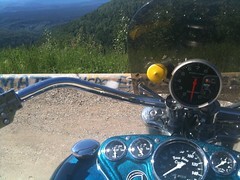 The bike continues to be somewhat if an attraction which got me gas after they were closed at one stop for sure. 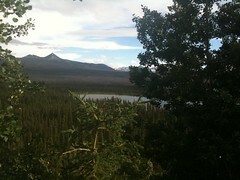 Luckily, it was the last stop I needed to make it into Teslin. 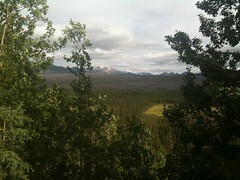 As I approached Teslin, I saw one of those Scenic View camera signs at a Rest Stop overlooking Teslin. Thinking I was done for the day, I decided I had time for what looked to be a gorgeous shot. I'll let you decide for yourself. 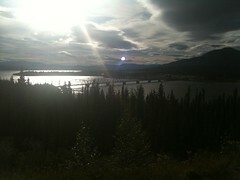 I had intended to stop for the night in Teslin. Low and behold, but who should I run into but "Witness the End" on their return to Alaska from their tour! 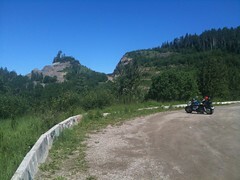 Between them and a couple on a Harley all insisting how close Whitehorse was, the bright sun, and constant reminders of how short a trip it would be for me on my bike... Whitehorse bound I was! 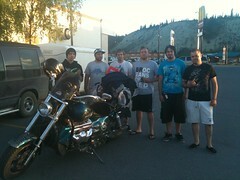 The guys left 20 to 30 minutes ahead of me and I caught them just outside Whitehorse. I had to stop for fuel again as the distance was about 10 miles further than I could make it. They passed me as I was finishing and I caught them again. We went to MickeyD's after to eat and visit. I got a hotel and they jumped back on the road. (I'm old and need my sleep!) To be fair to the guys, the van had some issues and they were "Baby-ing" it home. It is always so cool to run into friends from home unexpectedly! Well, the total for the day was over 615 miles! Longest day yet for mileage! That's more than enough for now Grizzly-nauts! Shut-eye time to prep for what may be a long day again tomorrow! 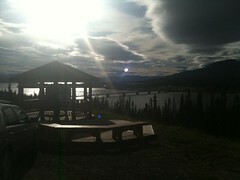 Posted Tuesday morning from Whitehorse in the Yukon Territory. Looking good! glad you're enjoying the route. Again, you're making Pop jealous....... be careful, call when you get in. When ya make it back , swing by for cake and ice cream hegege,,,,,,,,Tracey made it in.